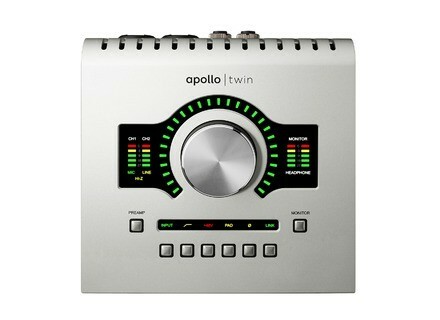 Apollo Twin Duo USB, USB audio interface from Universal Audio in the Apollo series. I use this sound interface to complement (not to say replace) my old ESI ESP 1010e. I went up in terms of range and it’s a real investment but believe me – it was worth it. Latency is ridiculously low, especially in direct monitoring. Using the Unison technology, which implies replacing the clear-sounding and modern (yet high-quality) interface pre by a Unison-compatible plugin (eg a Neve strip, vintage preamp, some guitar amps too), monitoring is still direct. Unison allows to change the physical preamp’s behavioe using a plugin, which is an amazing technology. The installing process was seamless, and the same goes for the plugins (the included bundle + a special offer which consisted in $749 worth of plugins + a $79 off coupon on an Helios EQ + those I purchased to take advantage of other special offers – seems like I bought it right on time ). Yet, there were audio problems with the sound dropping but it got resolved with changes within Windows and the use of a special PCI-e USB 3.0 card instead of the motherboard’s chipset (it seemed to work with a mere update, but you never know). Thanks again to the UA tech support, they really know their job. I work on an 17 5820K with 32GB of RAM. This leads me to a problem I’ve encountered: the plugins work on an internal DSP on the card, with a total only 2 DSPs as it’s a Twin model. Its capacity soon gets exceeded, which implies freezing the tracks, saving the settings and make clear decisions then to reset to the default mixer screen so as to empty the DSPs. In native mode, I can use many mort plugins without saturating my Computer, so it’s a real pity that you can’t mix the DSP and PC’s power, as I could use many more UA plugins than I currently can (I sometimes have to use SE versions of the plugs on secondary tracks). Lat alone that point, quality of the converters and preamps is incredibly good! Used with a nice microphone (a Neumann TLM 102 in my case), the result is exceptionally good, especially considering that the Unison allows to tweak the sound using channel strips, vintage preamps emulations and so on. But even then, the original preamp stands its case and is more than usable! The mixer is both easy to use and very practical. A real asset! Most parameters can be controlled both using the mouse or the interface’s controls. - the DSP technology which causes more problems than it helps. It once was very practical (in the days of the UAD-1), but nowadays the processors are so powerful that the UAD-2 is surpassed and it’s a pity. It still can be useful for someone with a small setup, but it’s not my case. However, this interface is more aimed at home studio owners who work alone, and for that purpose it’s still a very fine interface. I’d make the same choice a million times if necessary. I hesitated between this and an REM Fireface, well I’m glad to have entered Universal Audio’s universe! When I can, I intend to buy a UAD-2 Octo (Satellite USB 3.0 or PCIe, depending on the better compatibility, I’ll see when I have the budget) in order to use more DSP power and take full advantage of all these wonderful plug-ins. With such a high-quality interface, I’ll also have to invest in good microphones as the only really good mic that I have is the Neumann TLM 102 (I also own a lower quality condenser T-Bone, a ribbon T-Bone, an SM57 and an SM58). If you can afford an interface in that price range, don’t hesitate and go ahead, you won’t be disappointed! 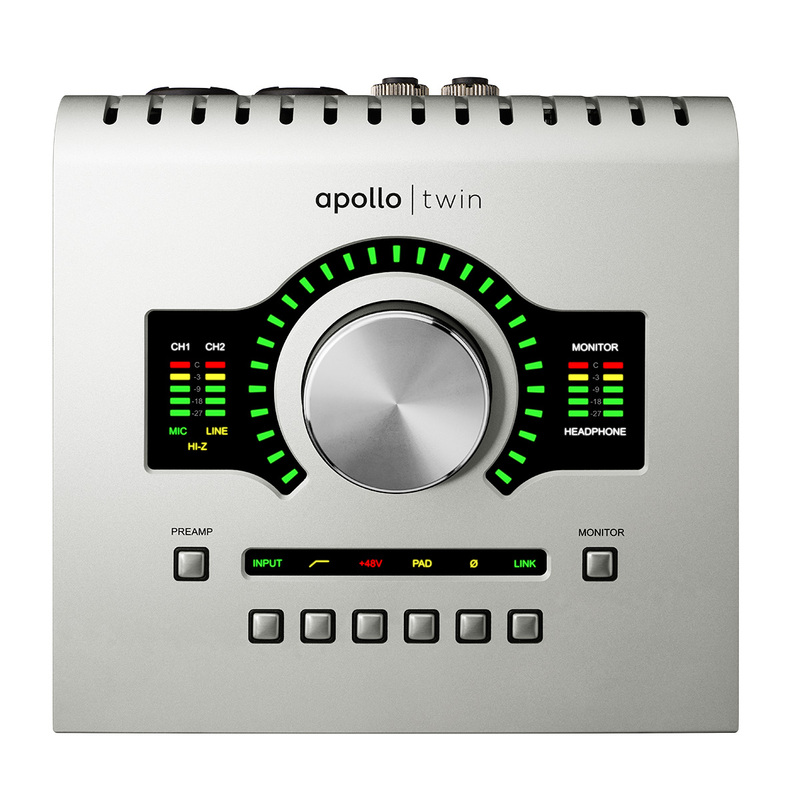 It’s also a pity that it is the only Apollo available for Windows system computers, i would have preferred an Apollo with more inputs and two headphone outs, and most important more included DSPs… But for 899€, you already have access to an exceptional quality! So let’s not demand too much, a 600€ interface with a lot of ins/out will never reach this one in terms of quality. CAUTION: if you work on a laptop PC, there is a risk that it will not be compatible with the USB 3.0 chipset. Look up for yourself beforehand. For the internal mixer, only the interface’s two DSPs can be used, but it seems well enough with only two inputs, unless you really have to use several plug-ins which is something I rarely – if ever – do. The Twin MKII and its Quad version are almost unnecessary, unless of course you want to use it for mixing (I speak for those who do not own additional UAD-2 cards). Months later, i still consider it a great product!!! (and the problem with the audio signal which was dropping has almost vanished, except in very rare circumstances which are not even that much of a problem when it happens). PS: I went to Cubase Pro 9 in the meantime (taking advantage of the grace preriod), and the software is even more stable than before, with crashes becoming rarer… I actually still have to face any, if I remember correctly.